Gerrit and Evert Loo in PEI spent years breeding potatoes for organic production. They wanted a blight-resistant potato that people would enjoy eating. Raymond Loo, Gerrit’s son, took some time in April 2012 to explain the process of developing the potatoes to David and Jen Greenberg. We are interested in continuing the work to further develop blight-resistant potatoes. It was a fascinating story about a farmer plant breeding initiative that yielded two cultivars of potatoes with blight resistance: Island Sunshine and Island Sunset. The story shows a real desire in the Loo family to spend a lot of time and effort creating something simply because it helps out fellow farmers. I’ve grown both Island Sunshine and Island Sunset potatoes. Island Sunshine is very yellow inside. Island Sunset is red on the outside. I remember they were great potatoes for blight resistance. You don’t see them much anymore. Raymond: I can’t register Island Sunset anymore because it has already been grown too much. I’d never be able to get breeders rights on it – and I don’t want to. But I don’t want anyone to take it and call it theirs. I think it has been out long enough that you couldn’t do that. It has been fingerprinted. You have to really keep it from somebody grabbing it and fingerprinting it and saying ‘this is our potato’. You have to fingerprint it first. Island Sunset is fingerprinted. It’s expensive. You have to send it away to the States. Island Sunshine we have the breeders rights on, but it’s done now. Next year’s the last year. There’s nobody really growing them anymore. Raymond: A lot of it has to do with the agent we ended up getting. (Long story about that) We got a letter from Monsanto back in early 90s. They wanted to take the genes out that were making it resistant to blight and put them into other potatoes. There was a letter on the table and Dad saying “Now how in the heck did these fellas know about us?” But they did. So anyway, that was the catalyst for him to get breeder’s rights. At the time he realized we would have lost all control of the potatoes. They would do whatever they wanted with them and they wouldn’t be of any benefit to organic farmers. Breeders rights is quite a path. By the time you do your three years and your three different test plot sites to get your data to register them and you fingerprint them and then you get your agent… Dad and his twin brother (they developed the potato together) went and had a meeting with Cavendish about it. The Cavendish fellas were interested in them (Island Sunshine potatoes). Dad asked him how it would work. They said we (the Loo family) would get the royalties after they (Cavendish) took off all the expenses. But they wouldn’t give Dad an accounting of the expenses. So Dad was asking lots of questions and uncle Evert was stubborn. I’m sure Evert was asking questions too. So the Cavendish guy got up and said, ‘Look. I gotta get back to St John. I’m going to walk out of this room and give you five minutes.’ So they ripped up the agreement. Evert said, I gotta go home and feed the cats. And that was the end of that. Cavendish tried one more time, inviting Dad and Evert to St John. But that didn’t go anywhere. They tried a Dutch farmer co-op, AgriCo, and that was good for the first three years, but it got bought out by Parkland Seeds in Alberta. They were only interested in promoting Dutch potatoes. Not our potatoes. Parkland Seeds stopped developing seed. So all of a sudden there’s very little Island Sunshine available… anywhere. I’ve got a little here, but of course it is not certified seed because I’m not a seed grower. I’m going to plant these. There’s only a couple of trays here. We also discussed a variety called Bluebell. Raymond: When you peel them [Bluebell]…when you go to cook them… they’re greying fairly quickly. They will go grey in the pot so the restaurants don’t really like them that well- nobody really likes them- because they’re grey, unless you put a little bit of citrus or vinegar or something in the water to keep them from going grey. David: How are they with disease? Raymond: Good! That was a variety that Dad got in the early 90s, so it’d be twenty some years now, maybe even late 80s…and we’ve been growing them over and over and over again and they produce like anything. You’ll get the odd one that’ll have mosaic or something but you can just rogue them out and just try not to save seed from them. [Rogueing is pulling individual plants out of a field because they are inferior]. Blight wise… Early blight we haven’t really had any problems with any of these. We tested some varieties, put them out and just don’t do anything to them at all so you want 80% of them to get sick and be gone in the first year because you don’t want to bother doing all the work keeping track of them because they’re not going to be any good anyway, and then your early blight generally causes some leaf damage and stuff but I’ve never had much of a problem with early blight to cause us a great deal of difficulty, it’s the late blight that causes the real mess. Raymond: Well no, no no no no, it can come in July! And it’s just that it’s, it’s, it’s…bad. 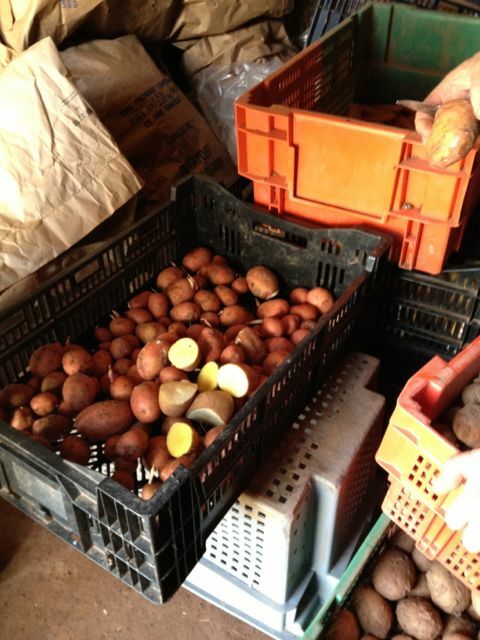 This entry was posted in farm mentors, growing vegetables, potatoes, seed saving and tagged potato variety, Raymond Loo. Bookmark the permalink. Fascinating – thanks for sharing these interviews.